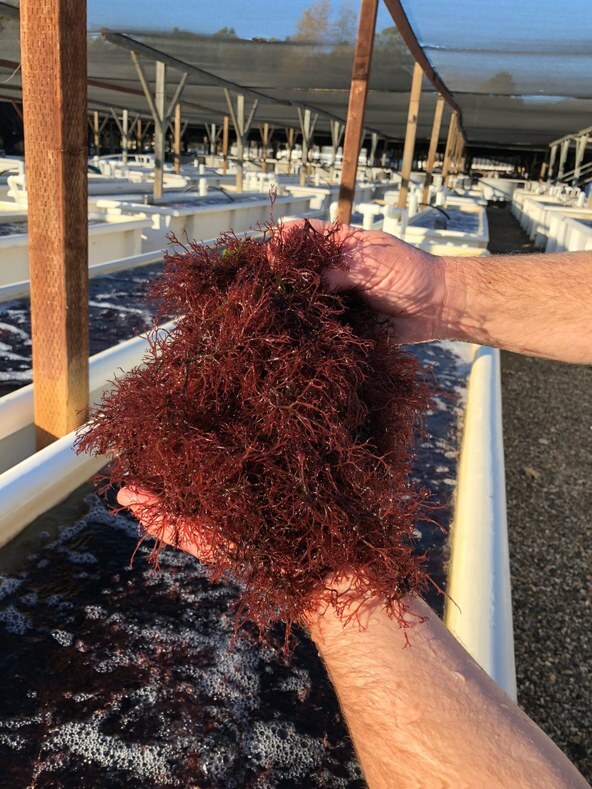 Off the coast of Goleta, sea farmer Doug Bush has been cultivating red algae seaweed since 2005. The jumbled red vegetable with fringed branches has led Bush to refer to it as a “pom-pom” of seaweed. He is one of the first local ocean farmers in what could become big business for California. “I don’t think seaweed is that weird anymore,” said Bush of The Cultured Abalone Farm, a California onshore seaweed and abalone farm in Goleta. “Some years ago it would have sounded exotic, but all our kids eat seaweed.” He notes that seaweed snacks can easily be found at big box stores like Trader Joe’s and Costco. Bush, seeing an opportunity in those crispy snack packets, is now mastering the art of seaweed farming. Bush originally began farming his Ogo seaweed as a natural supplemental feed for his farmed abalone before realizing it was a worthy food product of its own. Asia is already decades deep in sea farming businesses. The Chinese and Japanese governments have been supporting and encouraging large-scale seaweed farming for more than 70 years. Order a seaweed salad at a favorite sushi restaurant and that is likely from where it came. Bush hopes to change that, especially as land farming become less economically viable and as consumers get excited about the many nutritional benefits of seaweed. On the East Coast, aquacultural practices are more established with some farmers making a living off of seaweed alone. The Atlantic has a broader shelf with more protective waters and their native seaweeds tend to do well in a farming environment. However, taking the seaweed out of the tank and onto ocean farms in California comes with its challenges. Californian sea farmers who hope to farm offshore also face complex permit requirements at the federal, state and local levels. But many aquaculturists are exploring their options, and Reed thinks we could see large-scale California seaweed aquaculture farms in the future.